Spread unskinned almonds and flour on separate cookie sheets and toast each on top shelf of oven until nuts are crisp and flour is a deep cream color – about 15 minutes. Set ingredients aside to cool. Sift cooled flour with salt and baking powder and put onto a pastry board. Make a wide well in the center of the flour. Put the cooled nuts into the blender with the granulated sugar and blend until fine. Put the mixture, along with the butter and shortening, into the center of the well in the flour and mix until dough is crumbly, like pie crust. Put the dough onto a square of plastic wrap and gather together. Set the dough to chill for two hours in the refrigerator. Butter a cookie sheet, or use a silicon baking sheet. Unwrap the dough, and place it between two squares of plastic wrap. Press the dough out between the wrap with a rolling pin until it is ¼ inch thick. It will be crumbly around the edges. Using a cookie cutter 2 inches in diameter, cut out as many cookies as you can. Gather remaining dough and roll out and cut more cookies. Transfer cookies to cookie sheet with care, as the dough is fragile. Bake on top shelf of oven until they are a pale golden color – 10 to 15 minutes. Sprinkle well with confectioners’ sugar and set aside to cool. 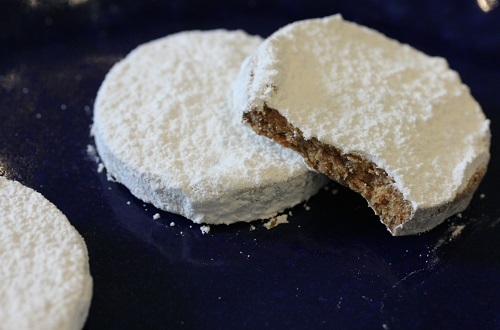 Remove polvorones to an airtight container.